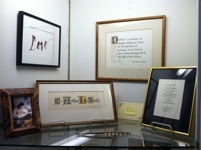 When Catherine A. LaRoche was invited to exhibit her calligraphy and other work at the Jaffrey Civic Center, she was asked if she might also like to display some of her calligraphy tools. She began thinking about her grandfather, J. Arthur LaRoche, who was an exceptionally skilled, professional calligrapher, and her first and one of her most influential calligraphy teachers. She had inherited many of her grandfather's tools, and thought some of these might be interesting to include. She also thought of her father, Roland A. LaRoche, who was an extremely talented painter and musician, and an excellent lettering artist. He was always very encouraging and supportive of her calligraphy work, and of her decision to follow her passion and return to her art career. 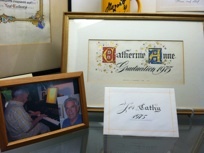 So in addition to showing her own work, which includes samples of commissioned pieces and gifts, as well as original pieces and framed archival prints for sale, Cathy wanted to honor and share the work of these two men who greatly influenced her life, as a person and as an artist. This exhibit provided a rare opportunity for the public to view a personal collection of work created by three artists – from three generations of the LaRoche family. 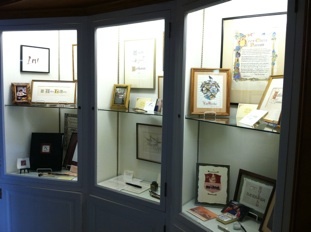 Many of these pieces were made as gifts for each other, or for other loved ones. For gallery hours and directions, click here.